The developments in the medical and beauty industries in line with the advances in science and technology, has enabled many medical conditions to be managed much more effectively thanks to the treatment options now available. While these developments contributed to the improvements made in all segments of healthcare services, it also initiated development activities to make the proper diagnosis and prescribe appropriate treatments for hair loss. This article which we prepared after conducting research, will be covering one of these innovations; ‘Hair Simulation’. Hair simulation, also known as scalp micropigmentation, hair tattoo and scalp pigmentation, involves the use of a highly specialized equipment and micro-needles to inject pigment into the scalp. This method is applied by perforating the skin with a motor driven device, using specialised needles to insert ink at the right depth. Micro pigments are applied at the epidermis level of the scalp, with the objective to replicate the appearance of real hair follicles. These procedures try to create the illusion of a full head of shaved hair. The aim is reduce the contrast between hair and scalp color. Micro pigmentation, is a appearance-based semi-permanent manipulation technique. Based on a person's skin texture, SMP treatment lasts for three to four years. The pigments applied to the scalp eventually dissolve and then disappear completely from the system. Micropigmentation cannot be done with tattoo pigments, because tattoo needles reach to a deeper layer of the skin. If it were applied with tattoo pigments, this would result in pigment migration between the layers of the skin and even lead to the formation of skin blotches. Moreover, the pigments used in tattooing are capable of colour change over time. Black colors can result in cold undertones such as green or blue. This situation will impair the natural appearance of your hair. For this reason, in hair simulation application, biodegradable ink is used. These pigments are naturally absorbed by the human body, which in turn, prevents color change in the future. In time, the colors will fade and then be excreted from the body. Hair simulation can be applied in 2 different forms. Both procedures are conducted in the same way but have different requirements. The first micropigmentataion application requires the entire scalp to be shaved free of hair. The second application is focused on creating a "shaded" scalp, generally for individuals who wear their hair long, with the goal to decrease the contrast between the scalp and hair. The objective of the regular shaven approach, is to mimic real hair follicles. 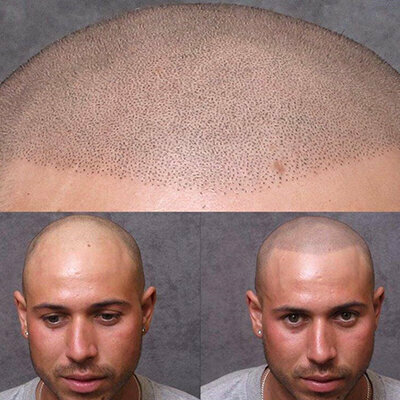 To create this simulation, the entire head has to be completely shaved. The pigments are two-dimentional in design and our hair, on the other hand is three-dimentional. After the head has been completely shaved, the two-dimentional pigments applied on the scalp, work together to create a uniform look of a 'just-shaven' head. In order to get the most out of hair simulation treatment; individuals suffering from severe hair loss, who have scarring alopecias such as alopecia areata and who experienece hair loss in a diffuse pattern are required to shave their head completely. 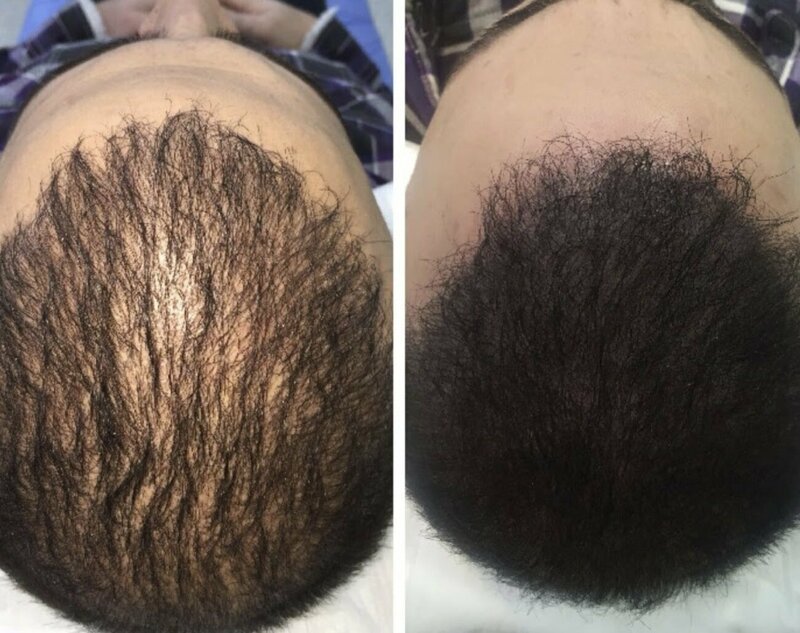 Hair simulation treatment applied without shaving the head, is generally performed on women experiencing hair thinning on the top or across the crown section of the head and for individuals who want to conceal small bald patches or for scar cover up. The objective of this method is to create an underlying effect, matching the natural color of existing hair and to cover or fill in thinning areas. Who Can Benefit From Hair Simulation Treatment? 1. Being a non-surgical treatment; the risk of infection is much lower and the patients recover faster. 2. With hair simulation treatment, in just 2 to 4 days, the patient is able to achieve the look of a full head of short-cropped hair. 3. Hair simulation application enables patients to conceal or diminish the visibility of any scarrings on the scalp. 4. Being a temporary application, after the pigments dissolve and fade out, patients can resume their former appearances. 1. There is only one achievable look that a person can use and because the hair pattern stays the same, changing it will require laser removal process. 2. Hair simulation does not provide a permanent solution like hair transplantation. The pigments used in the application last around 3-5 years. 3. In order to prolong the vibracy of the pigments and prevent from fading faster, patients are required to limit exposure to the sun and use high factor sun cream/block when they are on holiday. 4. To keep the appearance uniform and to make it less susceptible to detection, once every two days regular shaving of existing hair is required. 5. As the pigments will fade over time, this will require the patient to visit the clinic more often for touch-ups. These repeated sessions may lead the formation of blotches on the scalp. At Dr. Serkan Aygın Clinic we do not apply such a treatment. The purpose of this study, is to provide you an insight into the process and application of hair simulation. If you would like to receive more information and make an appoinment, please do not hesitate to contact us.